In 2019 it will be 30 years since the Berlin Wall fell. Today we see that border barriers are still erected all over the world. This inspired us to the theme for this 22nd edition of the Euro-kartoenale Kruishoutem: The Wall - in all its forms (habitation, border walls, climbing wall, fortification...). 1. The number of entries is limited to 5. On our website you can check the list of participants to see if you works have arrived. The entry list is updated daily. 3. The drawings shall have the following dimensions: A4 – 300 dpi, maximum 3MB for digital works. 4. The drawings sent by post must bear, on the reverse side, the surname, forename and address of the participant. 5. By participating, the artist agrees with this rules and the privacy disclaimer and authorize the organizers to publish the submitted works in the catalogue and for the promotion of the exhibition. For any other use of the cartoons the permission of the cartoonist is previously requested. On the occasion of the prize-giving ceremony, all the winners are invited for a stay of 3 days in Kruishoutem. 7. On request the participants get a free catalogue. However, the postage costs are for their own account. They can also collect the catalogue at the European Cartoon Center. 8. By participating the artist lends the submitted works to the organizers for itinerant exhibitions. Consequently, the selected works will remain at the disposal of the organizers until December 2020! The awarded works will become property of the organization. 9. The original entries will only be sent back by the organizers on written request. The organization can in no way be held responsible for eventually damaged or lost works. 11. 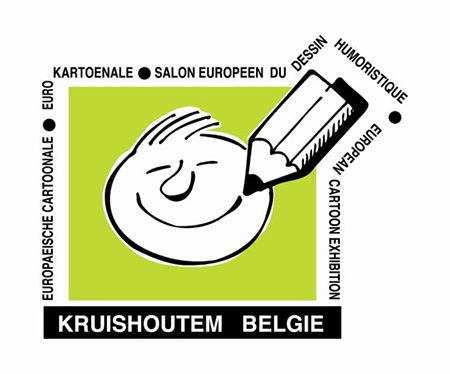 The international jury of cartoon professionals will meet in Kruishoutem on the 25th of January 2019. The complete list of jury members will be announced on our website after the expiry of the deadline. 13. The inauguration and prize-giving ceremony will take place in April 2019. The exhibition will run from April till June 2019.